The AUDUSD pair, from the technical analysis point of view, is at an historically critical support level. Since November of 2010 it has approached and bounced off this level no less than a dozen times. 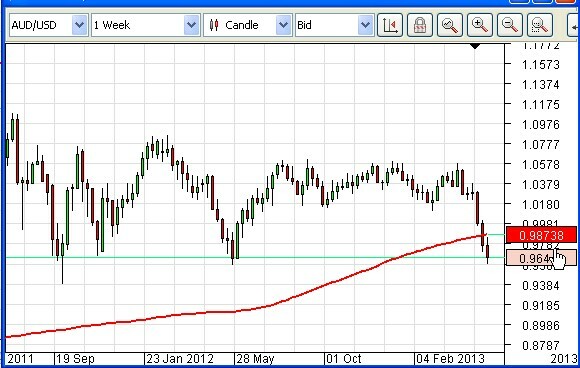 The red line in the illustration is the 200 period Simple Moving Average (SMA), a very well respected indicator. The last time price fell below that on the weekly chart, as here, it went through to exactly the extent that is has gone through it now before reversing direction. That was in May of 2010. Fundamentally, of course, the AUDUSD pair is under threat from a number of quarters. There is reason to believe that the Australian authorities are in favour of a lower AUD. Commodity prices, especially Iron Ore, which Australia exports in quantity to China, have been falling since February of this year. On top of all that, the US Federal Reserve is increasingly giving signals that it is about to extract itself from its bond buying program, which has been the means by which it facilitates Quantitative Easing. In the medium to long term this will have the effect of strengthening the USD, which should also cause the AUDUSD pair to fall. Algorithmic trading: Omicron Forex believes that, in time, the pair will in fact fall through the support mentioned above. Our Silver Trigger routine, which responds to momentum in the price, is now running, and is configured to only take short trades. We expect momentum to increase in the event that this support is breached, when the routine will enter a trade. We have also configured the routine to hold its trades over the weekends.